167 Commonwealth is located on the north side of Commonwealth, between Dartmouth and Exeter, with 165 Commonwealth to the east and 169 Commonwealth to the west. 167 Commonwealth was designed by Sturgis and Brigham, architects, and built in 1880 by Vinal & Dodge, masons, and J. W. Morrison, carpenter. It was built as the home of banker and broker Eben Rollins Morse and his wife, Marion Ronaldson (Steedman) Morse. He is shown as the owner on the original building permit application, dated September 4, 1880. The Morses lived at the Hotel Vendôme during the winter of 1881-1882, probably awaiting completion of their home across the street. Prior to that, they had lived at 241 Beacon. 167 Commonwealth was built on the western portion of a larger parcel that E. Rollins Morse purchased on March 6, 1879, from James Sturgis and Arthur Pickering, assignees in bankruptcy of John Heard and Albert F. Heard. John Heard and Albert Heard had purchased the land from the Commonwealth of Massachusetts on May 28, 1874. Click here for an index to the deeds for 167 Commonwealth. During the 1892-1893 winter season, the Morses were living elsewhere and 167 Commonwealth was the home of William Fletcher Weld and his wife, Ellen Homer (Winchester) Weld. 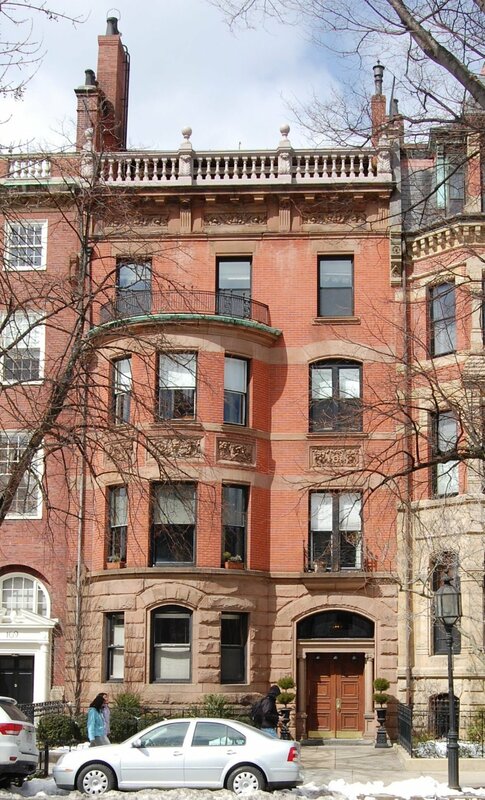 Their usual home was on their estate, Weld, in Brookline. The Morses resumed living at 167 Commonwealth during the 1893-1894 season, but were again living elsewhere for the next two seasons. During the 1894-1895 winter season, 167 Commonwealth was the home of Edwin Carlton Swift and his wife, Florence Abbott (Bailey) Swift. They previously had lived at the Hotel Vendôme. Edwin C. Swift and his brother, Gustavus Franklin Swift, founded the meat packing company, Swift Bros. & Co. (Swift & Company) in Chicago. The Swifts moved to 21 Fairfield by the 1895-1896 season. 167 Commonwealth (ca. 1882); Ryerson and Burnham Archives, The Art Institute of Chicago (Digital file #51191). During the 1895-1896 winter season, 167 Commonwealth was the home of Katharine (Lowell) Roosevelt, the widow of Alfred Roosevelt. He had been a banker in New York City; he was killed while trying to board a moving train in Mamaroneck, New York, in July of 1891. She had moved to 234 Beacon by the 1896-1897 season. 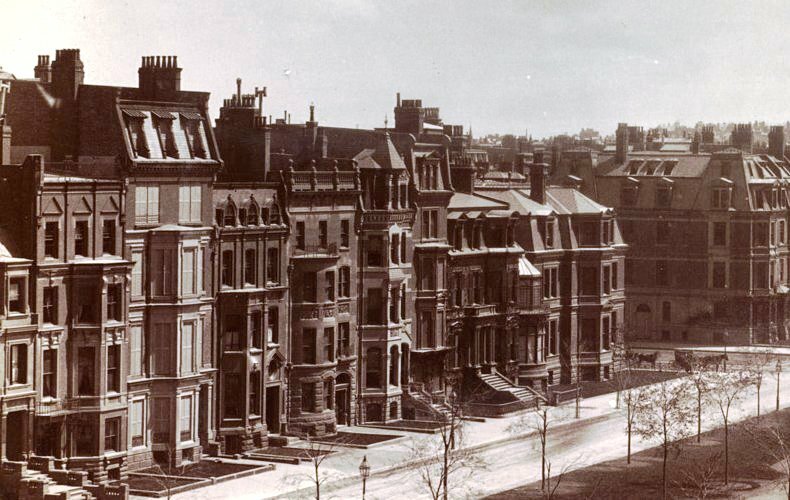 By the 1896-1897 winter season, the Morses were living at 167 Commonwealth again. In June of 1900, at the time of the US Census, the Morses were living elsewhere and 167 Commonwealth was the home of Marion Morse’s brother and sister-in-law, Charles and Mary (Lippitt) Steedman. 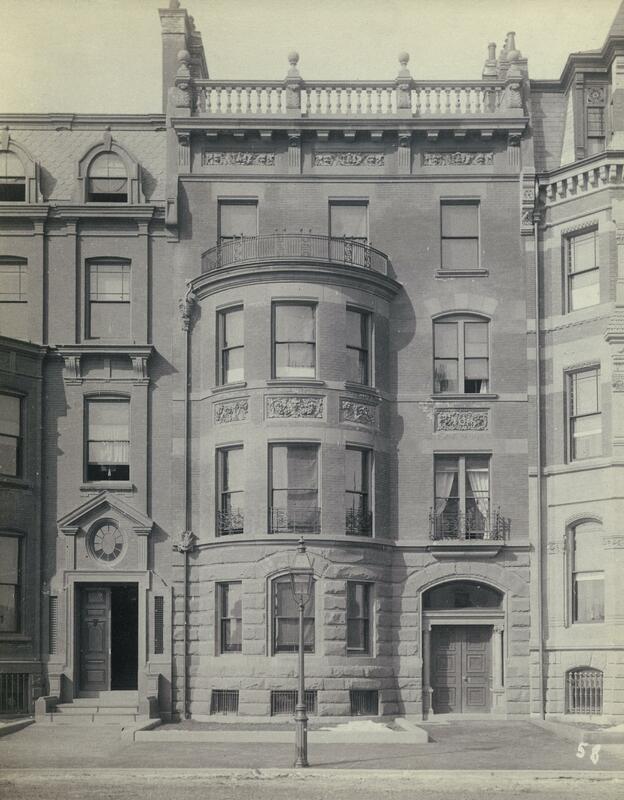 The Morses continued to live at 167 Commonwealth during the 1900-1901 winter season, but moved thereafter to New York City (in 1901, Ogden Codman, Jr., designed a summer home, Villa Rosa, for them in Newport, and in 1905 he designed their Manhattan home at 7 East 51st Street). On June 22, 1901, 167 Commonwealth was purchased from E. Rollins Morse by Frank George Webster. He and his wife, Mary Fidelia (Messenger) Webster, made it their home. They previously had lived at 232 Newbury. They also maintained a home in Holderness, New Hampshire. Frank Webster was a partner in the investment banking firm of Kidder, Peabody & Co.
Their son and daughter-in-law, Laurence Jackson Webster and Alys May (Rogers) Webster, lived with them during the 1901-1902 winter season. They had married in October of 1901. He was an electrical engineer with Stone and Webster, founded by his brother, Edwin Sibley Webster, and Charles Augustus Stone. Laurence and Alys Webster had moved by the 1902-1903 season. From about 1923, Frank and Mary Webster were joined by their daughter, Mary Ann Messenger (Webster) Sampson, the widow of William Clark Sampson, a stage actor, who had died in April of 1922. Frank Webster died in January of 1930. Mary Webster and Mary Sampson continued to live at 167 Commonwealth until Mary Webster’s death in December of 1932. The house was not listed in the 1934-1937 Blue Books and was shown as vacant in the 1933-1941 City Directories. On October 21, 1940, 167 Commonwealth was purchased from Frank Webster’s estate by real estate dealer Ray C. Johnson. On October 24, 1941, it was purchased from Ray C. Johnson by Miss Katherine Theresa Foley. She previously had lived at 115 Commonwealth, where she had operated a lodging house. Her nephew, Andrew Francis (Frank) Couney, lived with her; he also had lived at 115 Commonwealth. He was the son of Andrew B. Couney (sometimes called Andrew Francis Couney, Sr.) and Mae A. (Foley) Couney. In August of 1943, Katherine Foley applied for (and subsequently received) permission to convert 167 Commonwealth from a single-family dwelling into a lodging house. By the early 1940s, they had been joined by Andrew (Frank) Couney’s widowed father, Andrew B. Couney (Mae (Foley) Cooney had died in 1936). He was a former salesman with Seagram’s distilling. He had lived at 181 Bay State Road in 1940. In May of 1945, Rev. John J. Watson, Director of the Saint Francis de Sales Guild, wrote the Building Department regarding the legal requirements for establishing a center for the deaf and hard of hearing at 167 Commonwealth. According to a May 14, 1945, Boston Globe article, Archbishop Richard J. Cushing announced that the center would open on May 28, 1945, and would be the “first of its kind in the nation.” It is unclear whether it actually did open and, if so, how long it continued to operate. Andrew (Frank) Couney married ca. 1945, while serving in the US Army in France, to Elise (Lizette) Louise Duffour. They lived at 167 Commonwealth after their marriage. 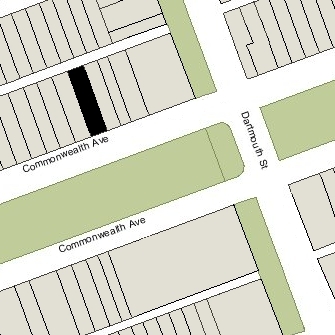 On August 23, 1946, Andrew (Frank) Couney acquired a half interest in 167 Commonwealth from Katherine Foley. On October 25, 1950, Katherine Foley and Andrew Couney transferred a one-third interest in the property to Elise Couney. Andrew B. Couney continued to live at 167 Commonwealth until his death in 1948. Katherine Foley continued to live (and operate a lodging house) at 167 Commonwealth until the mid-1950s. On February 16, 1956, Katherine Foley transferred her one-third interest in 167 Commonwealth to Andrew Couney. At about that time, Andrew and Elise Couney separated. In May of 1956 he married again, to Mrs. Joan (Donlan) McLean. Elise (Duffour) Couney also remarried by 1957 to Jacques Savarit and was living in France. On May 4, 1957, Elise Savarit transferred her interest in 167 Commonwealth to Andrew Couney. Andrew and Joan Couney continued to live at 167 Commonwealth until about 1959, when they separated. On October 28, 1959, 167 Commonwealth was purchased from Andrew Couney by real estate dealer Shirley Clifford Speed. Joan Couney continued to live at 167 Commonwealth in 1960, joined by her parents, Thomas Donlan and Rae (Emerson) Donlan. They moved soon thereafter to an apartment at 144 Marlborough. On January 5, 1960, 167 Commonwealth was acquired from S. Clifford Speed by Thomas F. Keating, Jr., trustee of the Pond Realty Trust. The legal use continued to be a lodging house, but from about 1961, it was shown as an apartment house in the City Directories. In June of 1973, the property suffered a fire which resulted in the death of one of its residents. In July of 1973, Thomas Keating filed for (and subsequently received) permission to make emergency repairs to close the building and make it safe. On August 7, 1973, 167 Commonwealth was acquired from Thomas Keating by the Wingate Development Corporation (Gerald Schyester, president). In September of 1973, it filed for (and subsequently received) permission to rehabilitate the building and convert it from a lodging house into nine apartments. On June 6, 1975, Wingate Development converted the property into nine condominium units, The 167 House Condominium.